First off I'll admit that I am a big fan of the Jamil Show and How to Brew, both Jamil Zainasheff and John Palmer consistently give great information and clearly know their styles. Brewing Classic Styles is a distillation of what was covered over the first three year run of the Jamil Show; it does not go into the same level of detail as the podcasts did, but it is much easier to find information in here than it would be to go back through the show's archive. It seems like after Brew Like a Monk there was a bit of a lull in good homebrew books. This one is the most recently published brewing book on my shelf having come out just about a year ago. 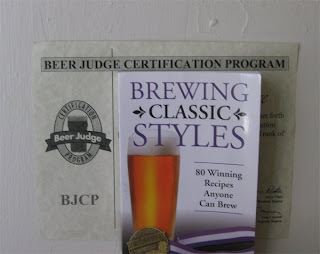 Brewing Classic Styles is a great book for someone who knows how to homebrew and wants tested recipes that will do well in competition. It is also a great book for someone just starting out. At that stage of your brewing career you should be using reliable recipes so that you can be sure any off flavors are a result of your system/technique and not your recipe. Content: The book starts out with a mini-version of How to Brew. It covers each of the major beer ingredients (hops, malt, water, yeast, and malt extract). This section contains some great charts. I really like the hop substitution chart which groups hops into categories which are acceptable to interchange. Next is basic coverage of how to brew extract beers. It is distilled down to the point of being a slightly more complex version of the instructions that come with beer kits. It really focuses on how to brew great beers without adding much about why these techniques work. That said it has some great suggestions, to the point that I almost want to give doing an extract beer a try again to see how it compares after years of pretty much just brewing all-grain. There is a section that spells out every assumption made in writing the recipes. Including efficiency, hop form, etc... This is very nice as many brewers will need to tweak the recipes for some combination of efficiency, boil-off rate, boil volume, and fermenter size. Next comes a brief section on lagers. Essentially it just covers the suggested fermentation and aging regimens. I wholeheartedly agree with their advice to pitch the yeast cold which goes against the "classic" homebrew technique of pitching warm and then dropping the temperature. Most of the rest of the book is structured just like the BJCP Style Guidelines. Each chapter covers a group of styles, with a section for each substyle. The coverage of each of the style includes a short write-up that talks about the style overall, an explanation of the key points in brewing each substyle, and sometimes the story behind the recipe. The last section of the book covers a few more odds and ends. This includes a section on Jamil's favorite topics, yeast pitching rates. It also goes over steeping specialty grains, and partial mashing. Recipes: It is easy enough to find a tried and true American Pale Ale or Russian Imperial Stout in most homebrew books, but where else will you find an award winning recipe for Roggenbier, English IPA, or Belgian Blond? These more obscure beers are more interesting anyway because most of us haven't brewed them. The 80 recipes in Brewing Classic Styles are sort of the opposite of the way Radical Brewing handles its recipes. Every detail is spelled out (exact yeast strains, fermentation temperature, boil time, very specific/obscure malts). It is a book that encourages hitting a target, not going off on your own to explore how to best suit a beer to your pallet. Most of the recipes are given as extract plus stepping grain with an all-grain option at the end. This strikes me as an odd setup as it is the all-grain version of each recipe that Jamil used to win his many medals. The extract recipes are just numerical conversions, many of which he had not even brewed. I understand that they are trying to make the book accessible to new brewers, but it still rubs me the wrong way to have to mentally apply the all-grain option at the bottom of the page to the extract recipe. I have to say that most of the recipes I have brewed out of this book (American Brown, Flanders Red, and Munich Helles) have been solid, but not spectacular. When trying to win a competition you want to land your beer right in the middle of the style so that no judge would deem it "out of style." As a result the recipes tend to be a bit bland, the pale ales aren't too hoppy, the sour beers aren't too sour, the stouts aren't too roasty etc... This may be desirable in a competition, but it isn't necessarily what I am looking for in my homebrew. I feel that there is a lack of imagination for the BJCP categories that are more open (Other Smoked, Specialty, Belgian Specialty, Fruit etc...). For example his Robust Porter recipe is reused as a Smoked Robust Porter, Chocolate Hazelnut Robust Porter, Vanilla Robust Porter, and Raspberry Robust Porter. I also would have liked to see something besides an Orval clone as a Belgian Specialty. There are a few substyles that get two recipes, (Russian Imperial Stout, American Brown Ale, and Schwarzbier). The alternate recipe is generally a bit bigger/bolder, but not quite as "to style" as the regular option. Accuracy: It is hard to talk about the accuracy of a book like this because most of its claims revolve around opinions about what makes a beer that will do well in competition. He is not claiming to be reporting clone recipe or history (although there are a few clones in there), just what has worked for him in making award winning beers. The sections at the beginning and end are fine, but since they are aimed at new brewers there isn’t much in the way of controversial topics covered. Readability: Concise, well written, and interesting. The organization is great, having each recipe in its own short chapter makes this book easy to reference and search through. That said it makes for a book that you really wouldn't want to read cover to cover. Overall: It is a perfect first or second homebrew book. It is also a great starting point for your first foray into any style, or for making an interesting base beer to experiment with. After reading through it you will definitely pick up some great information, but really it is just a recipe repository for making Jamil beers. Not that there is anything wrong with his beers, but I love homebrewing because of the creativity and exploration of flavors, not just to make beers that do well in competition. My real concern is that having loads of people brewing the same recipes will narrow the style guidelines when I feel they should be expanded. If there are 8 beers in a flight and 5 of them used very similar recipes/techniques which 3 beers do you think will be the first ones eliminated for being out of style compared to the other ones? I bet you'd be surprised to see how good an extract beer can be with experience like yours. When we started brewing, we started with extract, and our little instruction sheet. Your overall technique has drastically improved by now, and your extract beers will too. I brewed an extract batch recently, and not only was it much faster and easier, but it yielded a great beer. Glad to hear. DC Homebrewers and The Wort Hogs are planning on doing some sort of joint extract brewing contest. I figure I'll throw my hat into the ring and see how it turns out. But what really kills me about extract brewing is how much more it costs than bulk ingredient all-grain. I've been debating on whether or not to buy this for a few weeks now. I think you hit upon the main reason why I'd want the book: To brew a beer that isn't that common and still hit the style. The reason why I like that idea is to get a good idea where to move next, for example when brewing your first sour or first big beer. Anyways, your reviews are always great and provide details to let me know if I should or should not buy it. Good to know - I have listened to the Jamil show for a few styles, just to get some base info (I usually mix and match a number of sources and change it up somehow), and yes, he seems to fall on the Left Side of the Brain camp (whereas Rad Brewing would be on the Right). This book sounds like the "tablature" of brewing. I totally agree with your final comments. I brew with extract + a mini-mash (am new to brewing, plus wouldnt have space for all-grain), and it's come out pretty well so far! Great book, I love having a collection of good recipes on hand. I too get thrown off by the all grain information tacked on the end of each recipe, once or twice now I've missed an ingredient because it wasn't as clearly listed as in the extract section. The brewing basics sections don't do much for me though, just purchase How to Brew and be done with it! Recipe is such a small part of the overall equation, though -- the most perfect recipe in the world can't make up for poor brewing practices, and even two skilled brewers will likely get different results brewing the same recipe, simply due to differences in their systems and techniques. For these reasons, I'm not at all worried about too many people using the same recipes. And I also don't really think the BJCP styles need to be expanded significantly beyond where they are. The last thing we need are styles like the BA/GABF styles, where they've basically given in to pressure from the commercial breweries to subset the styles to the point where every beer brewed seems to have it's own style (thereby guaranteeing a GABF medal). I think there might even be a style that is "any beer brewed on a Tuesday before 11, by a female brewer of Irish descent." I was not suggesting that the BJCP should add more styles, quite the opposite I think there should be fewer style categories (Do we really need two categories for Alts or English Browns?). What I was suggesting is that they should relax the definitions for the styles that are already in place. I think the highest goal of brewing should be to make beer that tastes great, not to make beer that gets the closest to some platonic perfect form. It seems to me that a number of the styles are set up as clone competitions (for example brewing Saison Dupont seems to be the goal of the saison category). Commercial saisons cover a huge range of flavors/colors, but if you entered something like a Fantome Saison in the BJCP category many judges would probably deem it as not to style (too heavy handed with the funk, not enough peppery phenols etc..). The guidelines are getting better with each revision, but it seems like many of the judges need to familiarize themselves with the updates. If your looking for the core group of the old green board we've all jumped ship and set up shop at www.brews_bros.com. We'd love for you to stop by and join us if you have the chance. Same Mods, no BS. Great review, Mike. I really like the Jamil show as well...I think I have listened to every episode 3 times. I found it interesting to hear that the recipes are the generally in the middle of the BJCP guidelines but it makes complete sense. I am not a competitive brewer so hitting the middle of the guidelines is not a goal for me. Plus, the fact that the Jamil Show probably covers more than the book makes me realize that I would likely not get a huge benefit from the book.